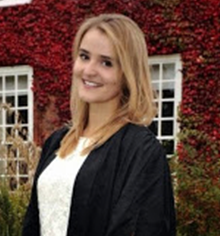 Aleksandra won the 2015 Female Undergraduate of the Year Award with Rolls-Royce. She is studying the same course from the same university as last year's winner Courtney Gill! Fresh from winning her award, we caught up with Aleksandra to find out how she found the process and why she applied! If my estimates are right, 12 months ago I was sitting in the library, trying to figure out the probability of failing my economics exam. More or less at the same time, the news about my one-year-older colleague, Courtney Gill, winning the Female Undergraduate of the Year Award was updated on the department’s website. Just out of curiosity, to make my procrastination a little bit more useful, I signed up for the TARGETjobs mailing list to get a reminder when the application process opened. If anyone told me then that I would see myself in the picture in a year, I would probably have started laughing. But here I am! Paradoxically, I have never met Courtney in person even though we study in the same department. But I would like to say a massive thank you for inspiring me to give it a go. And I want to encourage anyone with any doubts to do the same – just because you never know. In the beginning of the second term I got a terrible cold, and did not cure it properly because of the amount of work and extracurricular activities I had taken up. I ended up in my bed with pneumonia, unable to do anything just because I wanted to do everything. It is probably another important lesson I learned this year. However, having taken a step back, I slowly came back to life… and my mail box. When I got a final reminder about the award’s applications, something told me that this was a thing worth putting some effort into. The online application went quite smoothly, as well as a few tests that followed. I almost forgot about it then after a couple of weeks I got a message that… I am going to Derby! I have to admit that I had no idea what to expect from the two-day assessment at Rolls-Royce. But meeting with senior representatives and fellow students from all around the UK, and having an unusual opportunity to visit the test beds, seemed extremely exciting. Even though I am not studying an engineering-related course, I am very much interested in new technologies and innovation. However, I would never expect myself to find engines so interesting! I learned a lot over the weekend at Derby, but I also met wonderful people. I had an impression that after two days, for all 15 of us who took part in the assessments, it seemed like we had known each other for ages. Such a friendly atmosphere was extremely helpful during the assessments we had to go through. Of course, I did my best during each test, exercise or interview I had. However, for some reason I assumed that small mistakes I thought I had made simply ruled me out from the group of possible winners. I was already over the moon when I received an invitation for the final ceremony in Canary Wharf, and I genuinely did not expect anything else. I was happy to see again the lucky ten that I had met in Derby, as well as Rolls-Royce people and representatives of 11 other companies sponsoring the awards. By the end of the dinner, all of the finalists started to feel a little bit nervous and soon the first winners were announced. After the ceremony I got a couple of funny comments about my face expression when Eric Shulz read out my name from the stage. It probably pictures very well the state of shock that I was in. Today, a couple of days after the final, I still cannot believe it all, but most importantly I am extremely happy and honoured. It means a lot to me that there are so many kind responses to the news from everyone in Cambridge and my friends back in Poland. And, of course, I am very much looking forward to my summer internship at Rolls-Royce! I will try to post regularly about my preparations, travel and, of course, my time at the company. Product manager for Vivid Q.